Bharadwaja, also spelled Bharadwaaj (Sanskrit: भारद्वाज, IAST: Bhāradvāja,Telugu: భరద్వాజ), was one of the greatest Hindu sages (Maharṣis) descendant of Sage (Ṛṣi) Aṅgirasā, whose accomplishments are detailed in the Purāṇas. He is one of the Saptaṛṣis (Seven Great Sages or Rishis) in the present Manvantara; with others being Atri, Vasiṣṭha, Viswamitra, Gautama, Jamadagni, Kaśyapa. Bharadvāja Bārhaspatya is the progenitor of the Bhāradvāja family and the family is attributed as the composers of Sixth Maṇḍala of the Ṛgveda. Maṇḍala 6 is known as the Bhāradvāja Family Book as all its 75 hymns are composed by members of this family over several centuries. He is believed to be a contemporary of King Bhārata. Maharṣi Bharadvāja and his descendants were respected and powerful priests-like ṛṣi of several clans/dynasties of the Puru tribe, such as the Bhāratas and the Pañcālas. Sage Bharadvāja was a sage of the Vedic times. He attained extraordinary scholarship. He had the great power of meditation. His Āśrama still exists at the holy Prayag (Allahabad). Bharadwaja was also the father of Guru Droṇācārya and grandfather of Aśvatthāma from the epic Mahābhārata. His grandson rishi Aśvatthāma or otherwise called Drauni, will become one of the Saptarishi in next Manvantara. Bhardvāja or Bharadwaja is one of the most exalted gotras (family lineages) of the Brahmin caste. Brahmins with Bharadwaja gotra use Bharadwaja as their Lastname. Maharṣi Bharadvāja was the son of Devarṣi Bṛhaspati. Devarṣi Bṛhaspati was the son of Maharṣi Aṅgirasa. Angiras was the son of Brahma and Brahma came from Vishnu. These 3 Ṛṣi are called the Traya Ṛṣi, meaning The Three Ṛṣis of the Bharadvāja Gotra. Guru Droṇācārya, the royal guru to Kauravas and Pāṇḍavas in the epic Mahābhārata was the son of sage Bharadvāja. He was a master of advanced military arts, including the Devāstras. Among all the seven gotras Bharadvāja is the largest chain. Bharadvāja gotra has more than 1400 branches. He married Sushila and had a son called Garga. His son Dronacharya was born as a result of his attraction to an Apsara Ghritachi. He trained Drona in use of weapons. Drona also learnt the use of weapons from Agnivesha, Agastya's student and from Parasurama himself. Drona then went on to teach the weaponry to the Kauravas and Pandavas. Drona has a son called Ashwatthama who was an avatar of Lord Siva. Both Drona and Ashwatthama are Maharathas who fought on Kaurava side on Mahabharata war,in the Hindu epic Mahabharata. Bharadwaja had a daughter called Devavarnini. Yajnavalkya, the author of the Satapatha Brahmana was a descendant of Bharadwaja.The second wife of Yajnavalkya Katyayani, was the daughter of Bharadwaja. His achievements and contributions: Bharadwaja's Vedic mantras were placed in the sixth Mandala of the Rig Veda by Veda Vyasa Dharmasutra and Srautasutra were written by Bharadwaja. The manuscript of the latter was in Pandu script and is available with the Vishvavidyalaya of Mumbai. He was a master of the scriptures and Vedas. He was a renowned Sanskrit grammarian. As per the Rktantra, pratisakhya of the samaveda, Brahma taught grammar to Brhaspati who in turn taught it to Bharadwaja. Panini, Rkpratisakhya and Taittiriya have quoted and discussed Bharadwaja on grammar. He had an unquenchable thirst for the knowledge of the Vedas and in addition to his studies, meditated on Indra for long life for more knowledge. He also meditated upon Siva and Parvathi for more Vedic knowledge. He was a first hand witness to the incident of the Krauncha birds, where Valmiki uttered his first sloka. He was egoless. 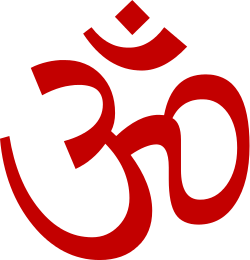 He spent a major part of his life spreading Vedic knowledge as per a command of Indra's. In Rāmāyaṇa, Śrī Rāma along with Sita and Lakṣmaṇa went on exile on own for the maintaining the dharma/words of his father. 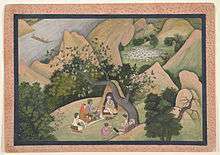 Rama along with them went through many forest regions starting from crossing Ganga river with help of Guhan, head clansman and a friend of Rama's father Daśaratha. As he traveled he visited many Rishi's Ashrams and met many rishis and sages including Agastya, Gautama and Bharadvāja. 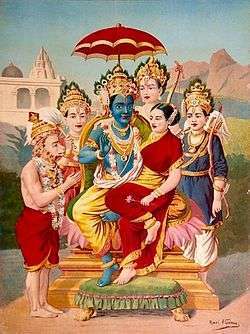 Śrī Rāma and others rested in Bharadvāja's āśrama when they were crossing Prayag and accepted his offerings as great sages knew that Śrī Rāma is incarnation of Mahā Viṣṇu, Sitā Devī is goddess Lakṣmī and Lakṣmaṇa is none other than Śeṣa Nāga. ↑ Gopal, Madan (1990). K.S. Gautam, ed. India through the ages. Publication Division, Ministry of Information and Broadcasting, Government of India. p. 76.